This post, the first for the year 2016 (and it's October!) 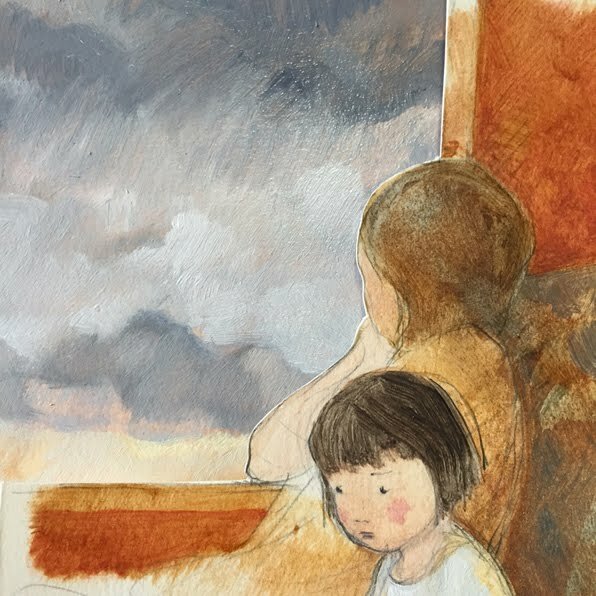 concerns a book I illustrated that has just come out, called Molly & Mae. It is written by the extraordinary Danny Parker. There are happy moments, boring moments, and exciting moments. I had longer than usual to complete this book and I suspect that because of this, I deliberated, and experimented, and queried and basically just made problems for myself. Having chatted with my publisher about landscapes appearing in the illustrations, I decided to use oil paints. I assumed it would be fairly simple to paint a landscape just like those by Roland Wakelin or Roy De Maistre. Hmm. I also liked the idea of those excellent, expressive oil painted brushstrokes, which was also harder than I assumed! 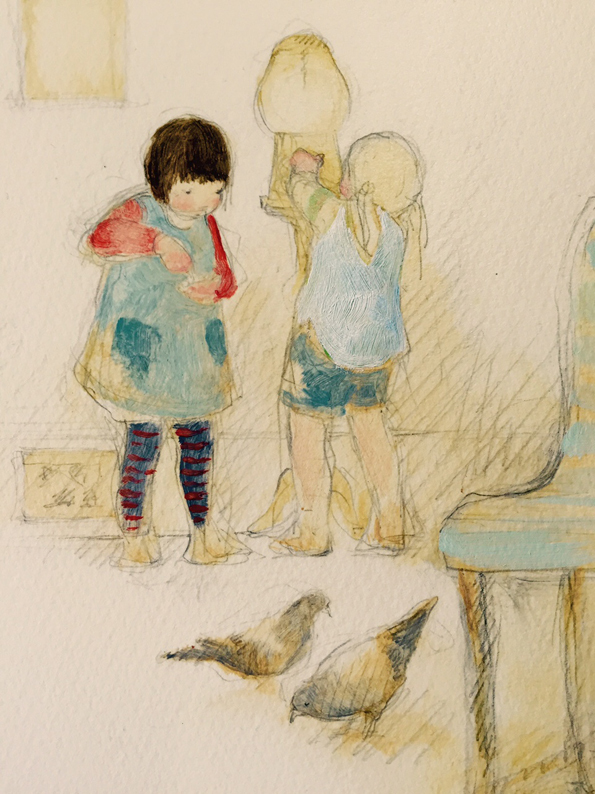 Here is one of the early attempts to illustrate the friends, using really thin oil paints and pencil. For some reason I didn't go ahead with pencil linework like this, but looking back on it, I really like it. I tried another page and it didn't feel any more right. I think I did five pages like this, and none of them felt right. In fact, when I looked at the works lined up in my studio it was like listening to music ever so slightly out of tune. It was grating! Finally, my dear publisher agreed that it wasn't working and I needed to start all over again. The burnt sienna became a kind of mauve, which is weird because it would have to be one of my least favourite colours. But with the mauve, the characters and their little splashes of colour stood out. 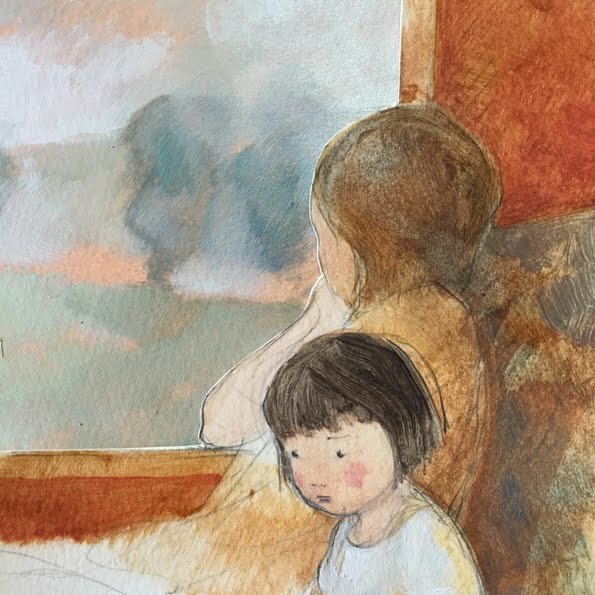 Then I inserted backgrounds behind the train windows and suddenly the book felt like it might work. I began to feel the despair ebb. I played with different coloured landscapes and eventually found a solution, but goodness, it was hard to find something that worked both for single illustrations and the full book. It's all a good learning experience, but sometimes I really wish I'd gone to art school and learnt how to do it all properly to start with! Molly & Mae was designed by Vida Kelly (and she did a beautiful job as always) and is published by Little Hare Books. My mum had to explain a lot of colour theory, which may have gone in one ear and out the other. I'm curious to know your inspiration for some of the scenes in the book. I'm fairly certain the skyline at the end is based on Edinburgh while the Glenfinnan Viaduct is possibly seen earlier in the book (at least inspired by?). However the train station interior at the end? Is this based on a real location too? Gorgeous book. Yes, the skyline was based on Edinburgh. The train station was based on a station I found photos of, but sadly, I don't think it exists anymore. And really, I just pluck ideas and merge things together to suit what I have in my mind! Thanks for the message. Sorry it took me SO long to reply! The pictures are excellent Freya....you are such a perfectionist. Can't forget "Perfect" inside cover dilemma. Wow! Fantastic art and great post. Thanks for sharing lot of a with us.